I saw this lovely fabric from Cath Kidston and fell in love with it! To the extent that I’ve gone mad making things to sell on my Etsy shop with it! I ordered the pale blue smudge spot and also the London toile. So far, the order of blue spot fabric has been diminishing by the day! I’m literally seeing spots! The London toile feels a more elegant fabric, as if I should be making a nice skirt out of it and not cutting it up at all! I’ve only made a practical pinboard so far – it does look striking though! I started making a set of triangular sewing pattern weights for use in dressmaking. These pattern weights are really useful when cutting out paper patterns as they hold the pattern still so you can pin and cut. Plus they look nice too. I’ve made a few of these over the past couple of years and they are fun to make! Then, I started on a large sewing organiser. I’ve made pocket sewing tidys and have had a few orders for a custom made A4 design. I sell a popular organiser which is made from a delightful retro sewing notions fabric by Makower. Unfortunately, its a hard fabric to find as they don’t obviously make it anymore. The large sewing organiser is A4 size and features a zipped pocket and an inside pouch pocket. Lots of room to store all your sewing knick-knacks. Plus its so handy you can take it on holiday with you or away babysitting for the night in my case! Next, I made a pinboard/memoboard/noticeboard – lots of people call them different things! I love making these pinboards as you can really be imaginative with contrasting ribbons and trimmings. For the blue smudge spot board, I opted for a “happily ever after” ribbon that I had stored in my ribbon box. ( I love going to different places and buying different ribbons – I’ve had some great ones from Spain, in particular)! Finally, inspiration came in form of a handy credit card wallet/purse. These are great to make with fabric scraps and again are fun to do as you can be imaginative with contrasting linings and colourful snap fastenings. In this case, I opeted for a red spotty lining with a matching red fastener. I’ve made quite a few of these little (and larger) wallets and they always go down well at craft fairs. What next then? I think I may give this fabric a rest for a while until inspiration strikes again. 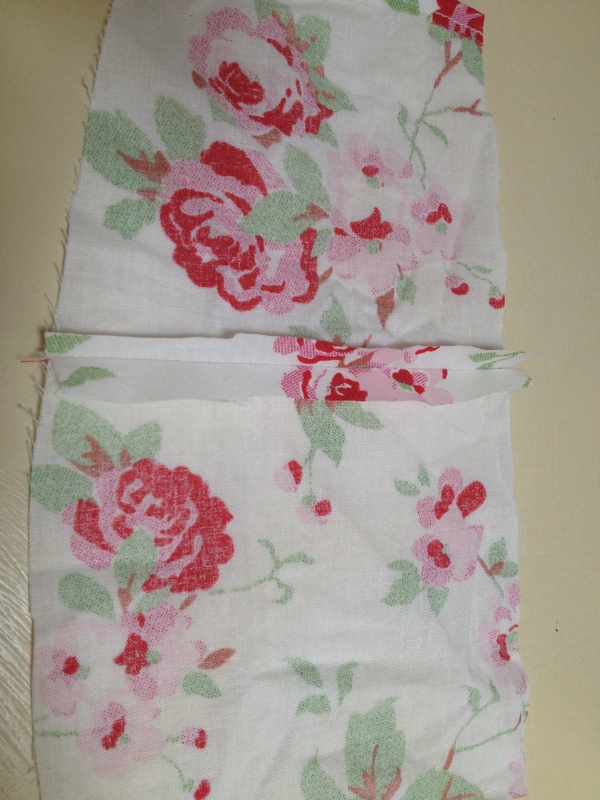 I’ve a lovely floral fabric next up! All these products are available on my shop or will be very soon! I decided a few weeks ago that I wanted to make changes to our downstairs loo. It was ok really, not long ago painted but it needed a loving touch and some freshening up! I was shopping in Homebase and picked up a paint catalogue and saw a lovely fuschia colour paint which I thought would certainly cheer the downstairs loo up. I said to my husband, “would you mind if we had a pink loo?” He reluctantly replied, “well, we already have a pink fridge, so I suppose so”. I thought I would ask my handyman friend to start on this after Xmas so didn’t think any more of it. I love Cath Kidston and their fabric is lovely. However, I always see if I can pick up a bargain in their sales. Fortunately for me they had one pattern of wallpaper, “Rainbow Rose”, reduced to half-price, so I measured up and ordered a couple of rolls (we have a fairly small downstairs loo!). It came a few days later and I loved it. Its extremely chintzy! My handyman friend came over last week to decorate. It took him a couple of days (fiddly pipework) but the effect is amazing! Its a real “in your face” bathroom! No subtlety spared. I love it! Even my husband likes it and admits its striking! Unfortunately the pink and green colours in the wallpaper don’t match the colours on the existing splashback. No fear. A bit of quick research on google and you can buy tile paint. in pink gloss! A quick trip down to B&Q and said paint purchased. Along with a pink chandelier! (the existing blue lampshade doesn’t match either). Ta-dah! A brand new bathroom for not a lot of money. Plus a real talking point for those visitors who need to use the facilities! I am now looking on what I can decorate next! In the meantime every time I open the bathroom door I smile! 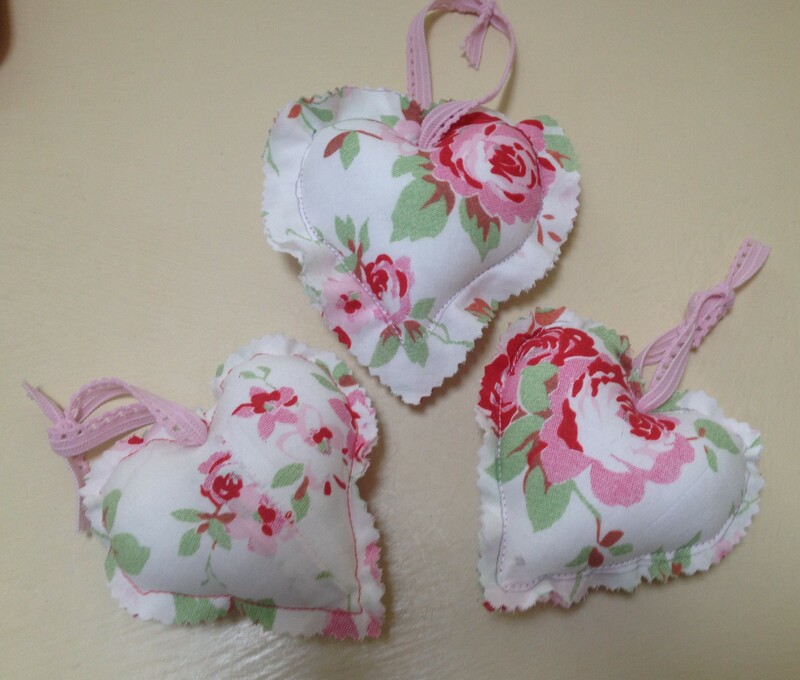 I decided to have a go at making these lovely hanging heart decorations after having some left-over fabric from the Cath Kidston designed “Rosalie” range from Ikea. 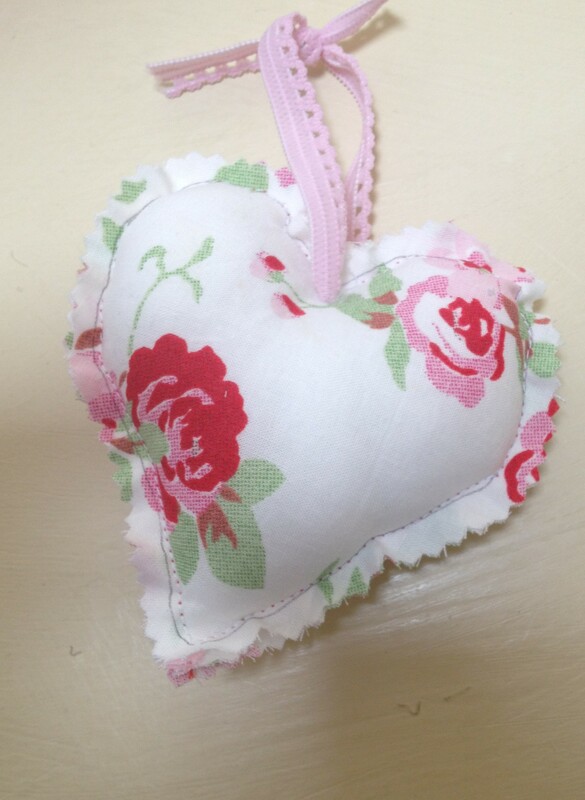 The first couple of efforts weren’t that successful as I couldn’t quite figure out after stuffing the heart, how to sew it up neatly so it looks seamless. However, after some trial and error I finally came up with a method that works that I would like to share with you. Firstly, decide how big you would like your heart to be. Mine are usually 10cm x 10cm, but you can make yours as large or as small as you like. Make a paper template. 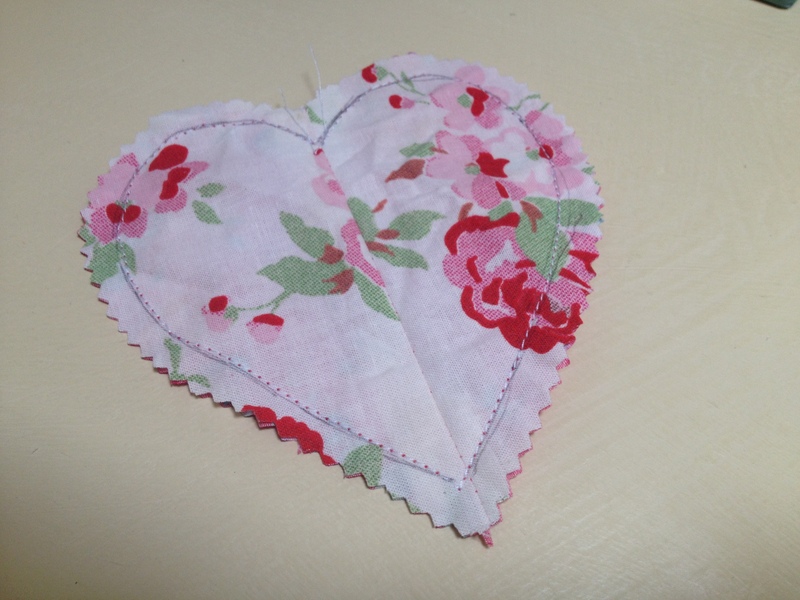 Cut out 2 squares of matching fabric 2cm bigger all round than the size of the heart. With right sides together, sew a 1cm seam down the centre. Open up the fabric with right side facing down. Now you will need another square of fabric, either the same, if you want both sides of the heart identical, or choose another colour. Place the new square of fabric on top of the square with the seam, wrong sides together and pin to secure. Place the heart template on top of the sandwiched fabric and draw round it with a fabric marker (or pencil, if you don’t have one to hand!). Machine stitch over the drawn template. You could even do this in a contrasting stitch if you like. 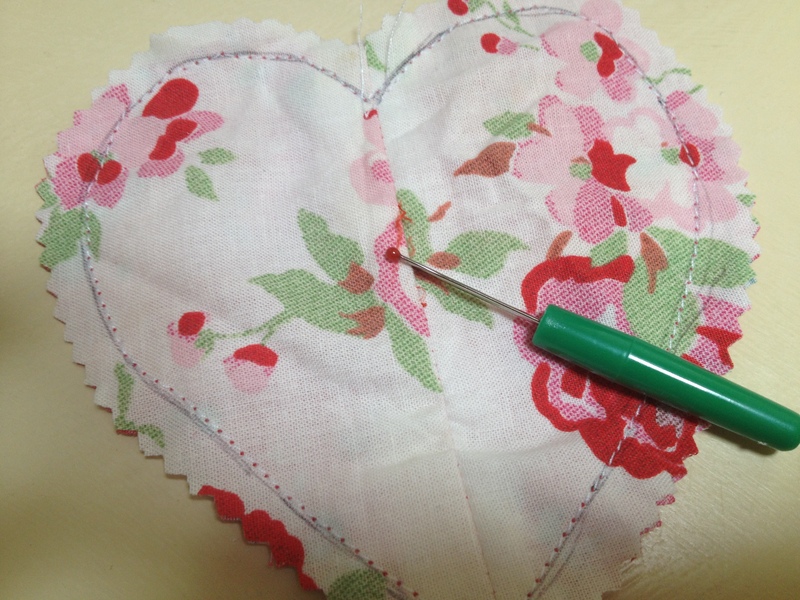 Once finished, use pinking shears and cut round the heart with about a 1cm gap all around. You will then need to unpick the original sewn seam in order to stuff the heart. Unpick a good inch to enable you to get the stuffing in. Once stuffed, neatly sew up. 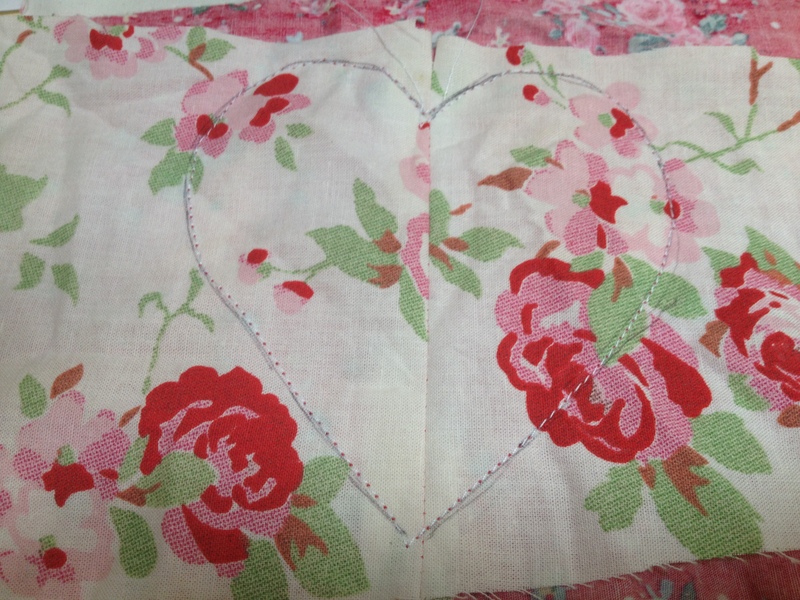 Finally, using a large darning needle, thread your choice of ribbon and just below the top seam of the heart, insert your needle so it goes through both sides. You may need to insert some pressure here! Once you have the required length of ribbon, cut the ribbon and tie in a knot. Hey presto! A hanging heart.